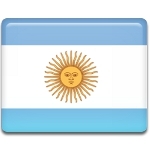 July 9 is Independence Day in Argentina. This holiday commemorates the day of declaration of independence of the United Provinces of South America. The territories of present-day Argentina, Peru and Bolivia were administered by the Spanish Empire. Buenos Aires became the capital of the Viceroyalty of Río de la Plata in 1776. The city repelled two invasions of British in 1806 and 1807, and the idea, that the country could defend itself from foreign invasions, bolstered the move towards independence. Argentina declared itself independent from the Spanish Empire on May 25, 1810. The first mass demonstrations took place on this day, however, official declaration was not pronounced. In May 1810 a new government of Buenos Aires was composed by locals and it replaced the Spanish Viceroy. This became possible due to the deposition of Spanish King Ferdinand VII by Napoleonic French. At the same time the revolutionaries split into two antagonist groups, that delayed declaration of independence for 6 years. The Congress of Tucumán declared independence of Argentina on July 9, 1816.